The religious education of children is one of a parent’s greatest responsibilities. This was a responsibility I was woefully negligent of when it came to my oldest son. I walked away from the Church when he was three years old. The only churching he got was on the rare occasion when he went to Mass with his grandparents or when he went with his mother to one of her progressive churches. She was now very anti-Catholic because the Church would not accept the gay lifestyle or ordain women. This created a great deal of animosity between her and her parents and an even greater deal of confusion for my son, which he still struggles with today. I have only myself to blame for this. I rarely shared my faith with my son and I tried never to address the gay issue with him out of respect for his mother. This meant that he only heard her beliefs and lies not countered become truth. I am happy that I have a son who is caring and respectful of all people. I wanted him to be that caring and respectful while still knowing the truth. It was time I step up to the plate and be the dad I am meant to be. At the same time I had two step-children who never got much religious education either. It was time that all my children learn about the beauty of the Catholic faith. The religious education program for children is called CCD or Confraternity of Christian Doctrine. The parish that we were part of charged a fee per child that put this program out of our reach. We made an appointment to discuss the matter with our parish priest. We told Father about our issues. He countered by asking how our Mass attendance had been. We admitted that it had begun to fall off. Our youngest, quickly approaching the terrible twos, was becoming more and more disruptive during Mass. This parish did not have a cry room and I thought it wrong to disturb people who had come to worship. We started staying away. Father told us that it was more important for us to come to Mass than it was for us to come to Mass at his parish. He recommended that we switch to a different parish closer to our house. That parish had both a cry room and a family plan for CCD. He would be sad to see us go but happy if we would continue to grow in our faith life. I had mixed feelings about this idea. This parish was the parish where I converted and came into the Catholic faith. I had a lot of history with this parish. The hardest part for me was that they had a very good and holy man as parish priest. A good priest is like a good doctor or a good mechanic. When you find one you want to hold on to them for as long as possible. My wife on the other hand couldn’t have been happier with the suggestion. Although she also liked the priest she was never comfortable in that parish. My history at that parish was with my ex-wife and her family and she could not see this parish ever becoming “our” spiritual home. There were too many constant reminders of past ties. I understood her feelings but had a hard time letting go. I am very conservative (orthodox) with my faith. My church was the old design, Protestant style church. The new church was more new fangled “church in the round” style. We had a conservative/orthodox priest. Who knows what the new church had. I had heard too many horror stories of poorly formed priests and liturgical abuses to be comfortable. In the end it was more important that my children receive the religious education they deserve and my wife be happy with the parish we attend than it was for me to be an unchanging stick in the mud. I took a chance and we switched parishes. 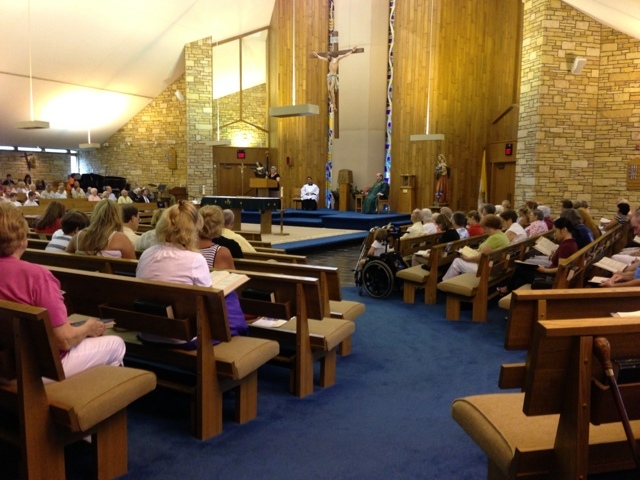 St Rita Catholic Church, Rockford, Illinois became our new spiritual home. My wife never seems to tire of saying, “I told you so.” St. Rita has been an absolute blessing to our family. My fears of a poor priest couldn’t have been further from the mark. Both the priest and his associate were good and holy men. Everyone we met was warm, welcoming and friendly. It was definitely the best move we could have made and key to our righting our relationship with God. Isn't it amazing how God takes us out of our comfort zones and puts us right where we need to be? Saint Rita's does indeed have a welcoming environment. The few times I've been there I have always felt it. Thanks for sharing.